Copenhagen's Trekroner fort once defended the city from unwanted naval arrivals. Now the city's making plans to defend itself from the sea. Image: Peder Sterll. Complex, long-term planning doesn’t often draw attention from sound bite hungry politicians. Foreground’s Andrew Mackenzie speaks to Melbourne’s Toby Kent and Copenhagen’s Lykke Leonardsen, two urban planning professionals working to future-proof their cities in the face of short-sighted vision. Andrew Mackenzie: I’d like to start with the question of time and in particular the difficult connection between electoral cycles. Lykke, what are the options you give to politicians when someone is going to be out of pocket? Lykke Leonardsen: Well I think there are two ways: The first one is making sure that there’s something in it for the politicians immediately. For instance, our water square is something we have already finished to present to them. So the current politicians have been able to go out and say, “this is something that we have done”. I’ve been positively surprised with Copenhagen’s politicians, because they’ve been acting with a little diligence – for them it’s important they’re doing something. They have understood the importance of having some of this connected system in order to have a solution that will work in the future. AM: Toby are there examples of ‘quick wins’ for politicians that you can think of… things that would get people onboard who might otherwise be skeptical? Toby Kent: The nature of urban forests is that there are no particularly quick wins, but it’s an example that does point to the need to identify things that are desirable. A “quick win” is about being able to position an idea that improves amenity and provides spaces that people want to live in. It’s not about asking for more money, it’s just about using our existing resources better. So desirability, affordability and practicality are probably the three things that are pretty fundamental to quick wins. AM: In Australia, it’s a significant concern because we have changes of government and a suddenly a billion dollars worth of road or rail or whatever gets wiped out. I wonder whether one response to that goes back a bit to your point Toby about not being one single metropolitan authority, but having strength in scale, when you’re dealing with Melbourne’s 32 local government authorities? TK: On a good day. A lot of resilience thinking has come from biology and ecological studies – a resilient system by nature is diverse. We’ve definitely had councils that have been not terribly supportive but then switched to being more supportive. As we implement the Resilient Melbourne outcomes, hopefully we have enough of a groundswell to carry the other councils that are less supportive at times. 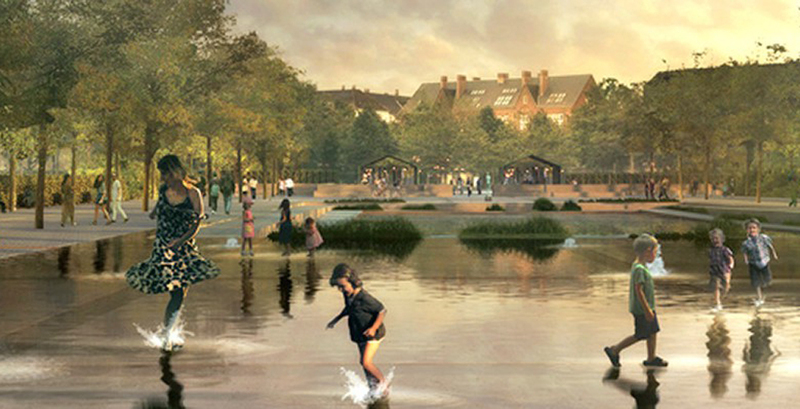 Enghaveparken ballpark in Copenhagen rendered during flood. Image: Tredje Natur Cowi and Platant. 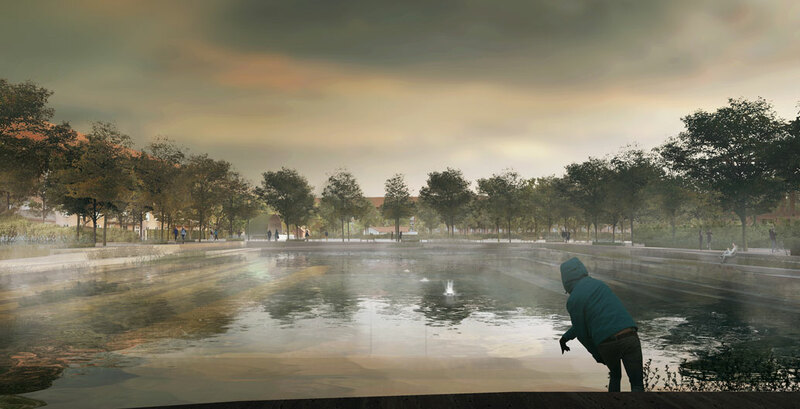 A 'water square' in Copenhagen that will be able to collect 26,000 m³ of water. Image: Tredje Natur, Cowi, and Platant. 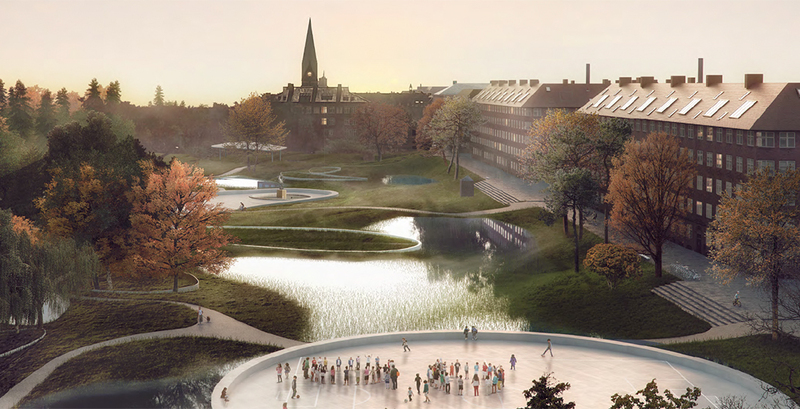 Proposal for another one of Copenhagen's water-sensitive parks, Hans Tavsens, after a heavy rain. Image: SLA. AM: In the case of Copenhagen, do you have reciprocal relationships with neighbouring regions? LL: We do. I mean one of the biggest is a creek project, which passes through nine different municipalities including Copenhagen, and so we have done a joint project to solve the flooding issues from that creek. 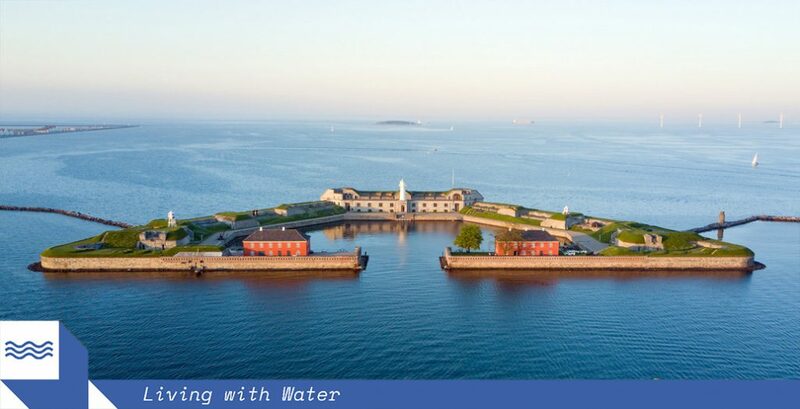 With this project, Copenhagen is investing money upstream with the other municipalities because we can see that the solution to a problem is not at our doorstep but is actually further upstream. It is possible to work across councils and I think that climate change in general will force municipalities to work across administrative boundaries. TK: I could also point to another example where one council put up a motion where they would pay to put in storm water capture upstream underneath a golf course but the other council voted it down, even though it was going to be paid for by their neighbours, because they said that wasn’t within their jurisdiction. AM: You can’t talk about long term projections in a city without mentioning population growth and densities. Was population density – and what that would mean for street amenity – part of your calculations in the Copenhagen adaptation scheme? LL: Of course it puts a limit to the amount of public space that we can actually look at and use because it’s going to be used for something else. The best outcome is to discuss with developers what structures they have in place to help defend their projects from storm surges and so on. And even though storm surge retention tanks are newer forms of infrastructure, there’s still a connection with our sewer system. So if you’re putting in more people in an inner city, you’re also affecting the sewer system, because as more people move in, the more things are put in the system. By improving storm water capture, we’re seeing it as a way of also reducing the need to build extra capacity on the wastewater treatment plants because we’re seeing things as an integrated system. AM: One of the elephants in the room with cities is how business and money intersect when making planning decisions. Lykke, did you have to bring the business community along with you, and if you did, how? LL: Only to a limited extent since all of this is going to be either financed by taxpayers money or utility money. The only corporates that we have really tried to involve have been insurance industries, because we’re sharing our data with them, and they’ve been sharing with us the damage claims that came after the first cloudburst hit. This allows us to formulate incentives for private homeowners to do something about their own buildings, so that they’re better protected. Melbourne's trams and tram stops are being retrofitted for social resilience - ensuring access for all. 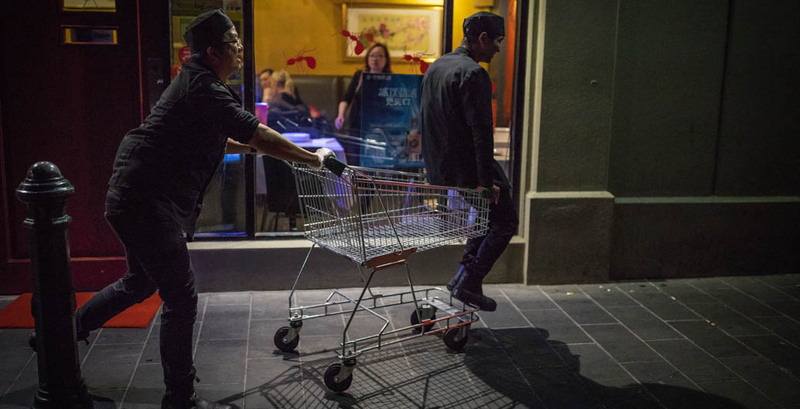 Toby Kent says Melbourne is suffering from the “peversity of social isolation“. Image: Chris Brown. AM: Toby, your journey into your current career path was through economics – you studied at the London School of Economics I believe. What’s your take on how important it is to bring the business community into urban resilience? TK: If you link this question with whether corporate interests can skew a city and how important it is to include them, it’s important to bear in mind that business is like a large family – so what one part does isn’t necessarily consistent with what another part of it does. So, speaking hypothetically, you can have some property companies that are doing some really great things in some places, and yet might be profoundly undermining a whole range of other aspects of a city’s liveability. If we’re going to get to a world that is more just and frankly less disaster-prone, you have to have the corporate sector with you. Two final points on that: One is that corporations are made up of people who are citizens and potential activists. So how you tap into that is part of the solution. And while times are uncertain we also exist in perverse times, where cities are responding to politicians and others who are less forward-looking. AM: Two years ago, [the academic] Naomi Stead gave a presentation at a landscape architecture festival that was about eschatology, which is the study about the end of times. It was a very interesting way of looking at climate change scenarios. What she said was that hundreds of years ago, the churches wanted to normalise behaviour by telling people they were going to burn in hell forever if they did something wrong. Her proposition, or her provocation, was we tend to actually dial back the actual risks of climate change so scientists don’t get howled down. But do we actually need to scare people? TK: Have you ever been at a dinner party where someone asks: “If you only had half an hour left to live, what would you do?” I don’t think anybody would talk about policy. The answer’s usually to break open the drinks cabinet, so that’s the challenge. I’m rather taken with a phrase by the environmental activist Paul Gilding, who likens the work that we’re doing on climate change preparedness to the existential threat the allied forces faced in Europe during World War Two. It’s the equivalent of the British forces doing press ups on the beach – really good stuff, probably better that you do it than not – but at the end of the day it’s not going to win any wars. AM: Lykke, do you agree? LL: I don’t believe in scaring. When you look at the climate skepticism, changes are spoken about like an apocalypse and you can’t help but sit there and be despondent – you might as well break open the drinks cabinet. So I don’t think scaring people does any positive thing to our thinking. I think we have to be serious, we have to acknowledge it, and yes in Copenhagen facing one metre of sea level rise. But our idea is that if you do it the right way, things can be flexible – because we don’t really know for sure what’s really happening. I say to people that climate change preparation is like building a bridge to Sweden… only that Sweden is moving a little bit every day, so you need to have a dynamic planning system that embraces diversity. This conversation was made possible by the National Gallery of Victoria, the University of Melbourne and the Australian Institute of Landscape Architects (AILA).